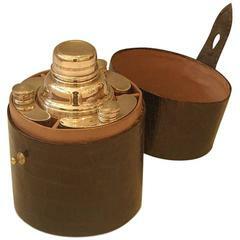 English cocktail set in a leather case, circa 1930. A really interesting item holding cocktail shaker lemon squeezer and small shot cups and glass dispenser for angostura bitters or Lemon juice. The description on the flasks reads French ( for brandy) Italian ( for Vermouth) & Gin (English) The leather case is original and has had some restoration but is a little worn on back leather hinge and the top carrying strap has been replaced and is decorative more than usable. 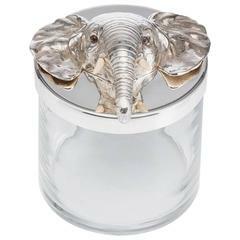 Austrian 20th century novelty ice bucket with an elephant mask handle and complete with faux ivory tusks, date circa 1930. 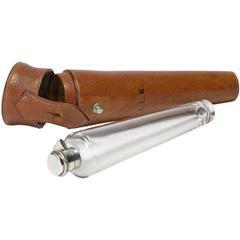 This is a striking British horse riding flask -- made of glass and silver and presented with its original leather case.